The Ministry of Health in partnership with Elizabeth Glaser Pediatric AIDS Foundation (EGPAF) on Wednesday launched a mobile clinic at Sefika Taxi Rank to bring primary health care services closer to vendors and taxi operators. 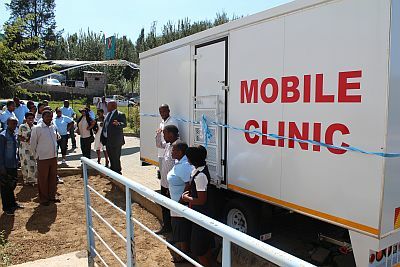 The initiative which forms part of the Ministry of Health’s effort to roll out mobile clinics across the country is also aimed at achieving the Universal Health Coverage (UHC) goal of ensuring that all people obtain health services as well as to provide services ranging from HIV testing and adherence to antiretroviral treatment (ART), cancer screening and referral of patients while Population Service International (PSI) has also partnered on the HIV pre-test and testing services. Speaking at the launching ceremony, the Minister of Health, Mr. Nkaku Kabi expressed gratitude that he is rendering services to a place which he once spent his time, working as a taxi driver for Mazenod route, saying he is familiar with the operations at the taxi rank and how busy its dwellers are. He said taxi operators and their helpers do not realise their worth and strength despite having raised renowned men and women holding high positions in Lesotho today. “It is at this very place that money to buy food and school uniform is raised, and this shows how important they are,” he said, highlighting that his Ministry is opening clinics at the hard to reach areas to enable UHC hence urged vendors and taxi rank dwellers to take advantage of the services brought closer to them for the benefit of their good health. Mr. Kabi further appealed to beneficiaries to make use of the facility to get health services and to protect the equipment so that the staff deployed at the clinics render services as expected thus with passion, dignity and respect for the people. He said services to be provided include cancer screening and HIV/AIDS testing. Also speaking was the Principal Secretary (PS) for the Ministry of Health, Advocate ‘Mole Khumalo who said bringing health services to Sefika Taxi Rank shows the importance of the people operating at the rank and thus ensuring their good health. He commented that it is unnecessary to be counting deaths caused by curable diseases hence appealed to the beneficiaries to utilize the clinic profitably and cooperatively with the staff for a smooth service delivery. On behalf of the vendors, the chairperson of the vendor’s committee, Mr. Molefi Paneng said they are humbled by the gesture, adding that this is the second time a member of cabinet from the current government visited the place to address some of their challenges at the taxi rank. He cited the first visit by the Minister of Small Businesses Development, Cooperatives and Marketing, therefore thanked the ministers for their efforts and urged vendors to take advantage of the services brought closer as this will save time of their daily busy schedules. The mobile clinic staff comprise of a nurse and professional councilor from Elizabeth Glaser Pediatric AIDS Foundation while the Ministry of health contribution include mobile clinic and medication.